Those wacky Log Cabin Republicans. They want so badly to be loved and accepted by the party that raises millions of dollars through rousing fear of gays. 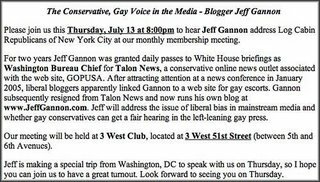 So it just makes sense that they would invite as a speaker a man who got into the White House under a phony identity writing diatribes against gay folks while poking men in the backdoor for money. You know Bob Dole is just jumping to be the follow up speaker here. 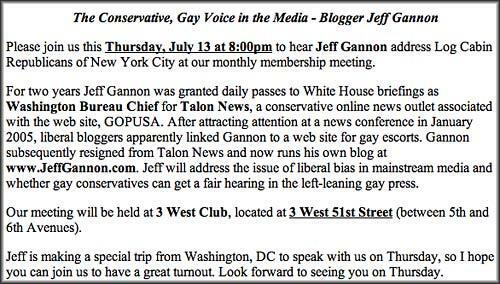 The topic here is what gets me, whether gay conservatives can get a fair hearing in the left-leaning gay press. I'm not sure about the answer to that one, but I'd guess you would have a better shot if you weren't literally a lying whore. I tell you, those gay Republican boys are an awful lot like Patty Hearst after she started robbing banks with the people who kidnapped her.